WE STILL TRY TO CATCH UP with comments in IP Kat, in particular because anonymous posters dump some information about the EPO over there (albeit a lot less frequently since the site stopped covering EPO scandals). There is a culture of censorship and self-censorship at the Office. Techrights, for example, is permanently banned by the EPO and IP Kat was banned for a day, whereupon it stopped covering the EPO scandals (self-censorship). The culture of fear, moreover, leads a lot of the employees to self-censorship and the union has almost gone ‘underground’ (barely any updates, not to mention resignations). I have been an activist for free speech for a long time; we have in fact received about 35,000 comments in this site and I never deleted even one (even utterly rude and abusive comments). A fortnight ago somebody attempted to silence me with legal threats (this made it into the media [1, 2, 3, 4] and got some comments [1, 2, 3]), but it backfired, just as when the EPO attempted similar tricks. As far as we know, it’s likely that the EPO bullies quite a lot of publications/journalists/bloggers with threats; we know for a fact it also did this to SUEPO. Now it tries to gag staff by a culture of terror and intimidation, as we noted here the other day. I hereby confirm that yet another colleague became victim of the IU. He works in The Hague, and he is not a union leader. There is hardly any SUEPO union leader left, so the IU needs fresh victims to prove their existence. It is sad that the IU annoys yet another innocent man, a friendly and appreciated colleague, father of 3 kids. 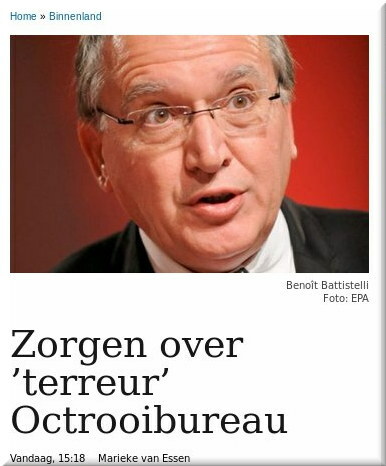 EPO staff are increasingly scared. This is mental torture for us all, and the Dutch high court recently decided that it would not protect them. For Battistelli this must be a sweet dream, using mafia tactics to punish some so that all others shiver and work harder. Sure the administrative council will pay him another fat bonus. Maybe the Dutch Supreme Court ignored ILOAT 1542 because it wasn’t brought to their attention by the lawyers pleading the case?